Dr. Maria Telkes (far left) received the first SWE merit award in 1951 for designing a distilling system using solar heat to convert sea water to drinking water. On the far right is Dr. Beatrice Hicks, the SWE's first president. The founders of the Society of Women Engineers weren't the first to fight the uphill battle of leveling the engineering field. In 1919, two female engineering students at the University of Colorado at Boulder tried to organize the American Society of Women Engineers and Architects. Lou Alta Melton and Hilda Counts managed to form a small, loose network of their peers, but their organization never really took off [source: Eller]. One very interesting product of their attempt was a tally of how many women had studied engineering in the United States up to 1919. Looking for potential members, they wrote to every university with engineering or architecture departments requesting the names of any women who were or had ever been enrolled there. They collected a total of 139 names spread out over 23 universities [source: Eller]. Change came briefly (and slightly) in the 1940s. 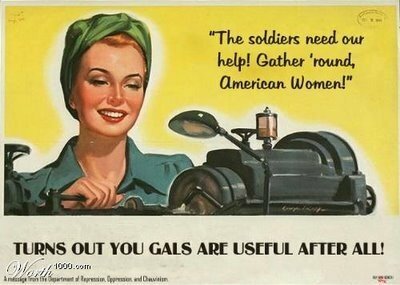 In the midst of World War II, the United States invited women to take on engineering-related jobs left open when much of the male workforce left for war (one poster offering, "Turns out you gals are useful after all!"). In that era, the Army Corps of Engineers boasted its first female mechanical and heating engineers, and the Army Map Service had a female geologist heading one of its research teams [source: U.S. Army Corps of Engineers]. Hydrology and surveying were opened up to women, too. And then the war was over, and most women returned to their previous roles in the home. The gender barrier had been cracked, though, and finding a woman in the engineering world was less shocking than when Melton and Counts tried to launch their network. In May 1950, about 60 of those slightly less-shocking women, many of whom had been networking less formally in the '40s, gathered at the Cooper Union College engineering retreat in New Jersey known as "Green Camp." There, they held the founding meeting of the Society of Women Engineers. Counts herself was to become a member [source: SWE]. The founders elected Dr. Beatrice Hicks as their first president. Hicks was a chemical engineer, an electrical engineer, a physicist, an inventor, and in 1942, the first female engineer hired by telecom giant Western Electric, where she helped to develop technology for long-distance calls [source: IEEE Global History Network]. Times have changed, but not as much as you might think. Sixty years later, the society has grown tremendously but still has many battles to fight.